All done with the my near-freebie turkey. Thankfully, it is now a much more manageable size with the meat removed and the carcass simmering away in my stock pot. Thats right, there will be a soup post in the near future. Going to turn my birdie buddy into my favorite Greek soup tomorrow if time allows. Anyway, on to how we dealt with this enormous turkey. Look at that beast! Almost too wide for my biggest roasting pan. So I went with a simple, reliable approach for this unplanned turkey. Herbs and lots of lots of butter, smeared under the skin to keep the flesh moist and flavorful. It is hard to go wrong with that. Though, can you go wrong with a dish when 'lots and lots' of butter is involved? I think not. Cream the mixture together and set aside. Now comes the fun part, where you get really familiar with your dinner. Starting from the neck cavity, slip your hand in between the breast and the skin of your turkey, separating any connective tissue. Get all the way to the other end of the breast making a pocket for all that yummy butter. Repeat on the other breast. Now, take about half the butter and slather it all over both breasts under the skin, using the pockets you've made. Take the rest of the butter and thoroughly rub it over the outside of the bird and inside the cavity. This part is a bit icky, I know. I didn't want to spend my morning elbow deep in a cold turkey, but some things just have to be done. Besides, if the girl who passed out twice in highschool biology can do it, so can you. I then take 8-10 whole fresh sage leaves and slip them under the skin, arranging them best I can to look pleasing once the turkey is baked. They are hard to see now, but once the turkey is cooked the skin will be crispy, golden and near transparent. The leaves will then show, making a pretty, edible mosaic under the skin. Once that is finished I sprinkle the bird with more kosher salt and fresh ground pepper, stuff some of my remaining fresh sage and parsley into the cavity and it is ready to hit the oven. Cook at 325°F for however long necessary for the weight of your bird. Check occasionally to see how it is browning, tent with foil towards the end of the cooking if the breast is darkening too quickly. Once the thickest part of the thigh hits 165°F your turkey is ready. 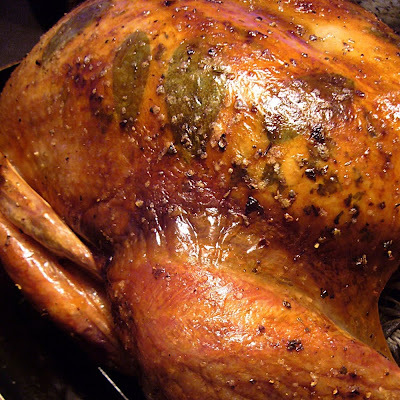 Allow the bird to sit for about 20 minutes before carving so the juices can saturate the meat. The end result should be a moist, flavorful bird with very crispy skin. Want, I know what I'm going to make for hogmanay dinner now, thanks! Thanks for the recipe. I followed exactly as you posted, and not only did the turkey come out beautiful, but it was moist and delicious. Everyone loved it! ohmigoodness I saw picture number five and immediately thought "who in the heck stole that turkey with coal/dirt on their hands?" ...and then promptly realized they were bay leaves carefully placed under the skin. oh boy. ...I'm actually having to force myself away from your blog to go to bed now. I'll blame you when my boss find me soring gently into my keyboard tomorrow.